In 1990 I left forever for India in search of enlightenment, only to return a few years later without having found any conclusive answers. Soon afterwards a friend showed me an article in a magazine. It was by a Belgian student who had been as far as China on his quest for immortality. He tells the story of his meeting with a Chinese doctor whom at a distance, sending the Chi through his chopsticks, stopped his hand, which was just about to take some food, in mid air. This doctor was now staying in Gent, as a visiting professor at the Gent University. Without hesitation I called for a rendezvous. The next day I went to visit him and said I would be interested in studying with him. He led me into a room and asked me to sit down on a chair with my eyes closed. He stood a certain distance behind me. A few minutes later I felt my body starting to vibrate slightly, then I started to cry as I had never cried before. Afterwards I felt enormously relieved and very light. The next day I called on him and he agreed that I could join the research team at the Buqi Institute. From that day onwards I followed all of his courses. In the beginning, I attended many evening and weekend classes on Taijiwuxigong Selfhealing. It felt as if I had to restructure the entire body. 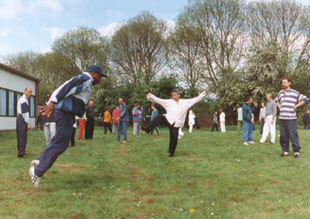 I was also studying Nanpai Taiji 37(1) and, with his daughter, Yang style Tai Chi. 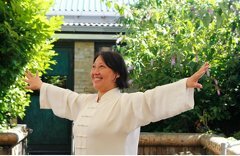 I had practised some Taijiquan previously, but what I learned here was completely different. Little by little I realised I was getting in touch with real knowledge. I also studied techniques of how to apply the internal Taijiquan forces to heal others in the Buqi courses. Besides that, in the Wuxi meditation seminars, I learned a scientific approach of how to meditate in order to develop latent functions, which can be used for Buqi diagnosis. In my life I had read many great masters; I had met interesting people; I had tried different techniques. But never had I come upon a method which takes care of body and mind so harmoniously and in which healing self and healing others become one. I was most surprised to experience the existence of empty force and to discover that even I could learn how to use it. I was happy to learn about binqi and the secret of staying healthy. Empty Force has become the topic of the day since the book on Empty Force by Dong and Raffil (2) introduced it to the general public. 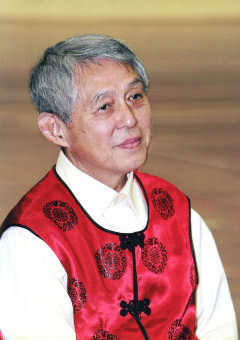 Dr. Shen Hongxun is a key exponent, having done extensive research and practice for 46 years. Even from several meters away, he can use a special force to move another person. This force is called in Chinese ‘LingKongJin’, which literally translates as ‘Distance Force’. However, in the Taiji world the abbreviation ‘KongJin’ is used: ‘Empty Force’ (3). During his courses, especially the Taiji 37 course, Dr. Shen Hongxun likes to use his force to play with his students. Very often he is behind the student (or several students) and without them knowing it, he pulls them, pushes them, and makes them jump or roll. Moreover, he can apply this force with high precision. The picture shown here was taken during a Taiji Forces course in Nijmegen, Holland and shows the student ‘flying’ through the air. In fact, everybody has this force, only we do not know it. Through certain exercises we can learn how to use this force. In Dr. Shen Hongxun’s Taijiwuxigong (4) lessons (and those of his daughter, Master Shen Jin), we learn the exercise ‘Qi BaGua’. We walk in a specific way in a circle, and try to push either a central post, or an opponent who is also walking on the circle. In the beginning we are not really successful, but after 4 or 5 times most students notice that they can indeed influence the movements of an opponent from a distance. How can one send out empty force? To do this, one has to totally organise mind and body. First of all, the mind needs to concentrate strongly. For instance, if you want to push 1kg for 1m, you must concentrate as if you want to push 100kg for 100m. The body’s organisation starts from the abdominal muscles which lead the organisation of all other muscles. There are two kinds of muscles: the large muscles which we normally use, such as the biceps, and the small muscles, closer to the skeleton, which are less commonly used. We try to relax the big muscles as much as possible. The small muscles can then become active and can be used for stretching. Consequently, the joints can open one by one from the torso via the shoulderblades, shoulders and elbows to the hands. This creates space for the flow of the body fluids and energy substances. In organising the body to apply empty force, breathing also plays an important role. The outbreath creates a downward force on the diaphragm, which strengthens the flow of the body fluids to the hands and feet. When this flow reaches the hands, mental force is used to send out to the patient’s body. If we want to send out a strong empty force, we must also be strongly rooted because then we can use the earth force. Its vibration force can rise in the body, meet the energy force in the belly and together rise further, through the spine, and, at the height of the shoulder blades, divide and move via the arms to the hands and be sent out to the patient’s body. The use of empty force demands the co-ordination of the whole organism. Empty force can only be applied when all bodily forces are concentrated into one direction. The force to do this also demands many nutritious substances. As Dr. Shen Hongxun puts it: ‘Empty force is not empty’. Ancient people used Empty Force for fighting and killing. One of Dr. Shen’s teachers, Prof. Yao HuanZi, was the first to use Empty Force for healing others. From this information, together with his own knowledge of TCM and Western medicine, Dr. Shen developed the Buqi Healing system. People often translate Qi as Energy. They think that keeping or concentrating the Qi in to the upper or lower Dantian, or in other parts of the body, is a way of maintaining health and securing a long life. Dr. Shen Hongxun does not like the idea of Qi being Energy. He often tells us the story of the He XianZhuan incident: the He XianZhuan qigong system was introduced to China on a very large scale. It teaches people to concentrate the Qi to one’s hands, chest or belly and then from a short distance, push it into one’s head. After only one year, more than 40,000 practitioners had become crazy. As many people again had other kinds of abnormal reactions. The central idea in Dr. Shen Hongxun’s teaching is exactly the opposite: one must start by pushing the Qi (binqi or the pathogenic factors) out of the body. Only at a much later stage will one concentrate the Qi in the dantian. Buqi is a system to heal self and others. An important point is the use of Empty force for expelling binqi. This enables doctors and healers to give treatment without touching the patient, and in this way they are able to touch the patient on a much deeper than just the physical, including on the emotional level. First, diagnosis must establish the location and type of binqi. Then, according to the principles of the double vicious circles and binqi theory, empty force is applied to take binqi out directly or indirectly by activation of nerves, hormonal glands, meridians, muscles etc. For practitioners to use Empty Force in treatment, they must first do exercises to develop this ability. The principle of these exercises is expulsion of Binqi, so body and mind become pure. Only then can the Buqi healer send out vital information. In fact, everybody knows what Binqi is, we simply do not have a name for it. Doctors often meet patients suffering from rheumatism who tell them that pain is moving in their body, e.g. from the left arm to the right leg. Also during massage it can happen that pain moves up and down the limbs. We call it the reaction of ‘pain-moving’. Not only pain, but also itching, swelling or red spots can move. These are caused by negative pathogenic factors, which we call binqi. I want you to do a simple test so you can see the binqi for yourself. Stand firmly with the weight on the front of the foot and push towards the wall with arms outstretched and hands open. Try to relax the muscles as much as possible and stretch the arms at the same time. Do this for about 5 minutes. Now look at your hands: what you see is a map of binqi which has moved to the hands: white spots under the skin means anger-binqi; grey-blue colour is sadness-binqi, red spots is fire-binqi; if the fingertips feel cold it refers to cold-Binqi, etc. Why does one have Binqi? To answer the question we must turn to Dr. Shen Hongxun’s theory of the double vicious circles and Binqi. A long lasting poor body posture will affect one or more inter-vertebral spaces, provoking an abnormal pressure on the nucleus of the inter-vertebral disc. The nucleus has a spongy quality as it is filled with liquid (body fluid). If compressed over too long a period the endosmosis meets obstruction. It becomes very difficult for liquid to enter the nucleus and the nucleus cannot return to its original state. The loss of its vitality together with spasms in the neighbouring muscles causes the narrowing of the corresponding inter-vertebral space. The circulation of blood and other body fluids in this area is then disturbed. Consequently, waste products (binqi) stagnate in the inter-vertebral space. Moreover, the narrowing of the inter-vertebral space will cause the vertebral body to irritate one or several nerves. If a sympathetic nerve is touched, it will influence the blood supply to the corresponding organs at the opposite side; waste products will stagnate in these organs and in the long run disease may occur. In the neck area, inter-vertebral arteries pass through the inter-vertebral foramen and transport blood through the basilar artery into the brain. Any cervical inter-vertebral space affected, or any cervical vertebral body out of its position, can cause one or more corresponding vertebral arteries to fold. The blood circulation to the brain is disrupted, which means less oxygen and less nutritious substances can be used. Moreover, as there is less blood flow to take away the waste products (binqi), the functioning of certain brain centres will be affected. It can cause dizziness, and in serious cases, numbness and even coma. Therefore the information transmission to the organs and tissues becomes blurred, and disease can occur. Negative emotions can produce certain chemicals with different qualities. For instance, in the case of anger, a gas is produced. Normally this gas can leave the body via the hands and the feet. If there is a too high volume of this gas in the body, it will accumulate on the diaphragm, creating a feeling of heaviness and fullness in the chest. If this gas starts moving, it can attack the surrounding organs or any joint(s) in the body. This production of negative emotion we call emotional binqi. Every day people produce binqi and expel binqi out of the body. If binqi cannot leave the body for some reason or other, however, it will stagnate and cause an uncomfortable feeling such as pain, itching, numbness or swelling. Therefore to diagnose any disease one should first find the cause of binqi stagnation. Treatment of many types of disease can be done successfully by expelling binqi. Acupuncture as well as herb therapy knows this, but only with Dr.Shen has it become clear and received its full emphasis. All the exercises for Taijiwuxigong Selfhealing and Buqi Healing he designed following this principle. It explains why qigong exercises in which one concentrates Qi to the head or to the belly can create abnormal reactions. Dr. Shen calls us laughingly, ‘supermen’ and ‘superwomen’ when during the Buqi classes we practice empty force. In the beginning, I had some difficulty believing that I would ever be able to do this. I remember the first time I tried. I was relaxing outside on a terrace where my friend’s daughter was serving. She had just sprained her ankle. I had only recently learned to work with Buqi, but I tried one of the techniques on the off chance. I was so surprised when, immediately after treating her, she told me the pain had gone. I felt like a sorcerer-apprentice! Now I often use empty force to help family and friends. My force and my sensibility have of course grown, so I now know what I’m doing! To practice the Buqi techniques, we always work in pairs. When we use the empty force on each other, it often gives surprising results: symptoms such as pain, stiffness, numbness, heaviness etc, disappear. Also remarkable are the emotional changes we go through when we practice techniques that take away emotional binqi. When we take binqi out of the chest, the person sometimes feels as if a stone falls from his heart. Just the other day a retired psychologist called me. She has been following all Dr. Shen Hongxun’s classes for almost three years. Originally, she followed the lessons just to keep young. She got more and more interested and is now, in preparation for her Buqi exam, treating some friends for case-studies. During this preparation period she was so stunned when confronted with the new force in herself that she wanted to talk about it. One of her friends who suffered from chronic sinusitis had no more complaints after only one treatment. Doctor J.S. from Holland, an acupucturist for many years, reports that he is now using the Buqi techniques more and more when treating; His patients are reacting so positively that after just two years, he now uses Buqi in about 90% of cases. A theory proves itself right by its results. Buqi has proved itself to me! What about you? Dr. Shen Hongxun gives a Taiji 37 seminar once a year. In taijiquan there is BaiPai and Nanpai, or the Northern and the Southern fraction. Taiji 37 belongs to the Southern fraction. Almost all Nanpai teachers perished in the Japanese bombardments in WWII. One of the few who escaped, Xia Zhixin, was a teacher of Dr. Shen Hongxun. We will also use the term ‘Empty Force’ as it is in common usage. Taijiwuxigong is the name of Dr. Shen Hongxun’s qigong system. More about it can be found here.